Follow these easy, step-by-step, photo illustrated instructions for making our homemade Basic Cake Layers Recipe. Baking from scratch is much easier than you think. Why give credit to a boxed cake mix when you can bake your very own scratch made layers and, have family and friends raving about how moist and delicious your cakes always are. Basic Cake Layers Recipe: Made from scratch. 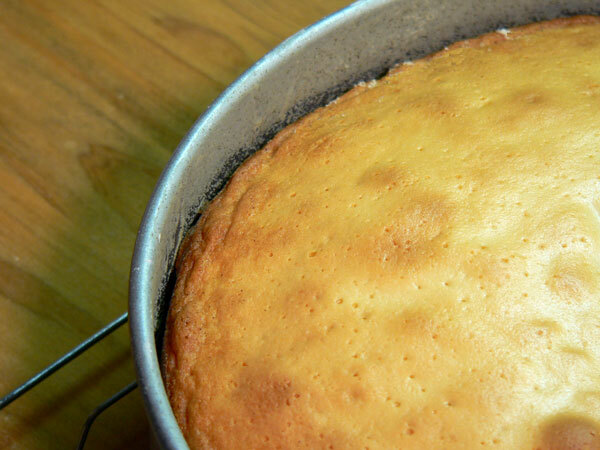 Sure, you can buy a boxed cake mix and whip up a pretty decent cake in just a few minutes. But why? Its just not your… style. Not only do you remember how great those cakes your Mother and your Grandmother made were but, you also remember how everyone raved about how delicious and moist they always turned out to be. Right? Wouldn’t you want folks saying the same thing about the cakes YOU bake? Now, you can keep those family traditions alive by baking up your favorite cakes from scratch. Great cakes start with great layers. And, these layers can be the foundation of so many different types of cakes, whatever the occasion. Just add your favorite frosting and you’re all set. It’s much easier than you might think. Taste of Southern is all about sharing great family recipes and keeping the basic knowledge of cooking alive for generations to come. Cooking and baking shouldn’t be a hassle for you. Sure, you’ll make mistakes along the way, we all do… and still do. Its just part of the learning process. But, we don’t give up trying and we continue to strive to provide the best that we can for our family and friends. It’s a great way to get the kids and Grand kids in the kitchen and make some memories they will remember and cherish for the rest of their lives and, hopefully pass on to their kids and Grand kids. So, don’t be afraid to pull out a bowl or two and that old mixer and, whip up some delicious cakes for them to enjoy. You’ll have fun in the kitchen, make some memories and, you’ll end up with some great desserts to share and enjoy as well. Whether you need a cake for that next Birthday, Anniversary, Bake Sale or for a special treat for the family, we’ve got the steps below to help you pull it off. You’ve just got to figure out what frosting you want to spread the layers with. These are Basic Cake Layers that are versatile for making a large variety of cakes. We’ve got some good ideas right here on Taste of Southern that you might like. So, go ahead and preheat the oven. Let’s Get Cooking! Basic Cake Layers Recipe: You’ll need these ingredients. Preheat your oven to 325º. You always want a good hot oven to start your baking. 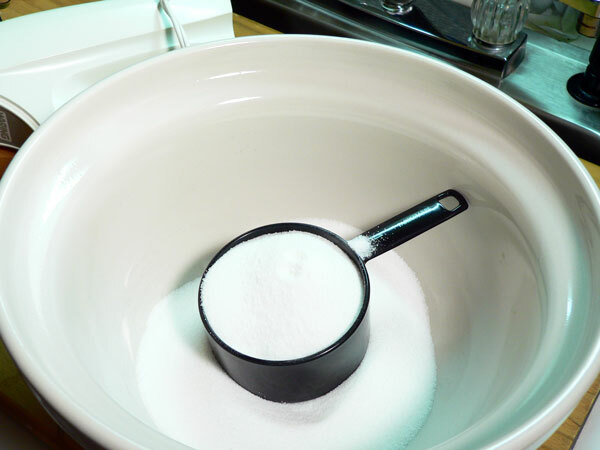 Grab a good sized mixing bowl and, add the Sugar. It’s cake… it starts with some sugar. You’ll need some room temperature Butter. 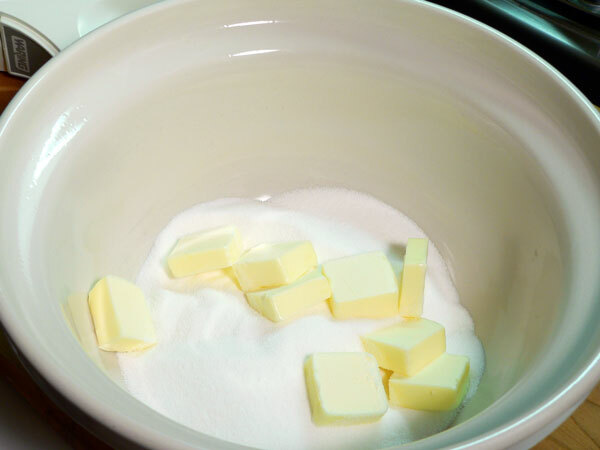 Slice it up and add it to the mixing bowl. Add the Shortening. I’m using Crisco for these layers. You’ll need to mix these ingredients together with a mixer. 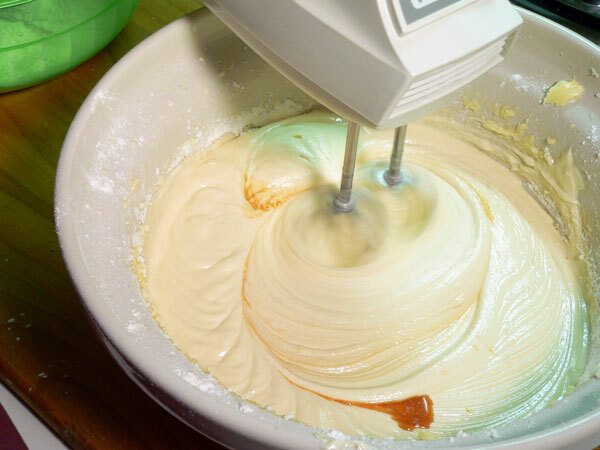 A simple hand mixer will do the trick but, a stand mixer is great if you have one. Just mix the ingredients until they become a bit “creamy” together. It will only take a few seconds to reach this stage. 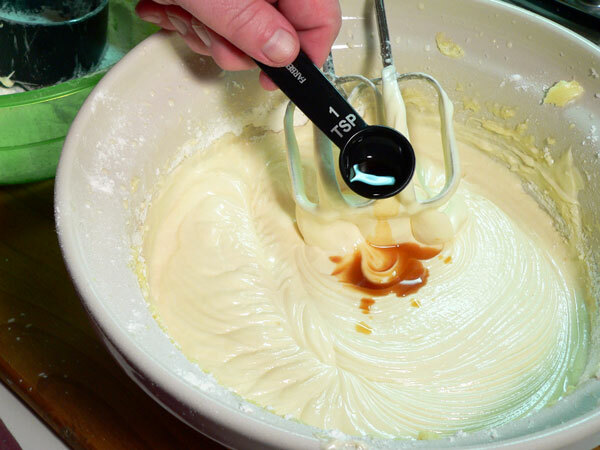 Throughout the mixing process, we also want to scrape down the sides of the bowl. 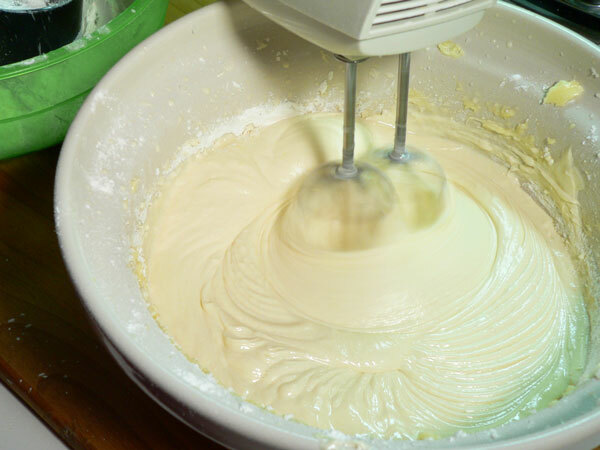 This gets any ingredients that might be clinging to the sides, that the mixer isn’t reaching, mixed in to the batter we’re making. I usually do this after I’ve added a new ingredient and mixed it in. Crack open one of the eggs in a separate bowl or cup. We’re adding the eggs, one at a time, and mixing each one after we’ve added it. 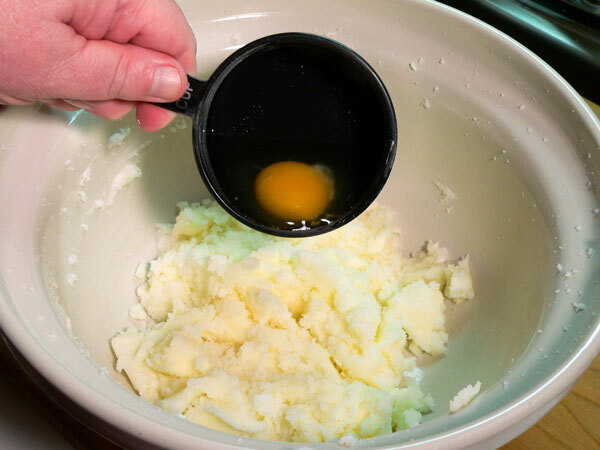 Breaking the egg in a separate container will help you to see any egg shell that might have fallen into the egg before adding it into the batter mixture. You want to remove that if it happens. 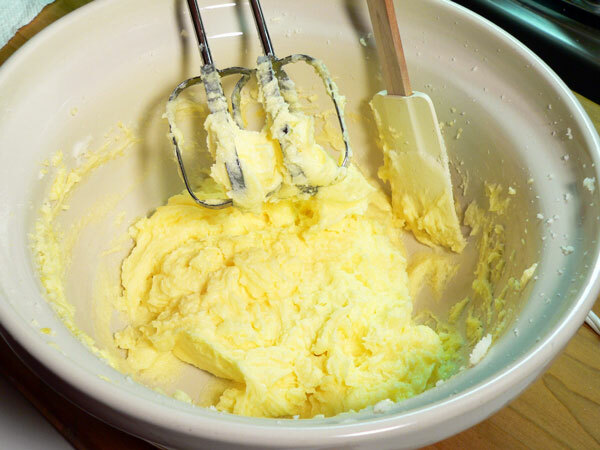 Using low speed on the mixer, work this egg into the batter mixture just enough to get it mixed good. 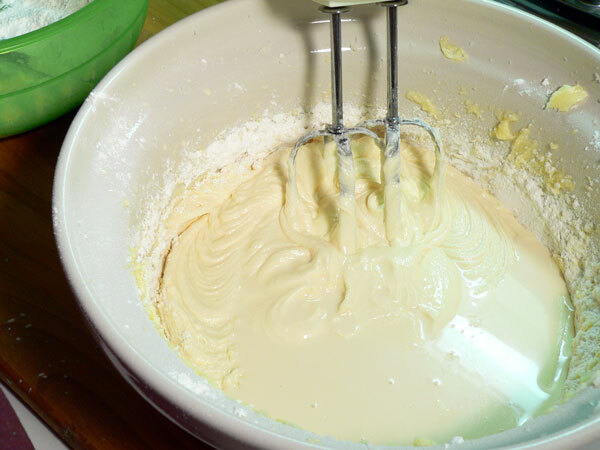 Repeat the process, adding one egg at a time and mixing, until you’ve got them all worked into the batter. Don’t over beat it, just make sure it’s mixed well after you add each egg then, move on to the next one. Be sure to scrape down the sides of the bowl again. Place a sifter in a large bowl. My sifter is marked in one, two and, three cup increments. The recipe calls for 3 cups of Plain Flour. Those need to be level cups of flour after its been sifted. 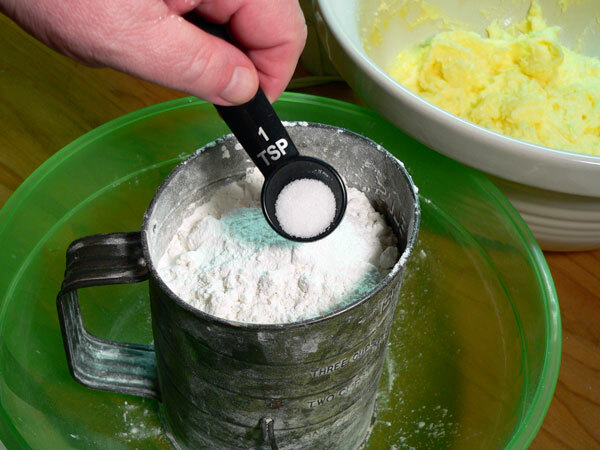 Proper measuring of the flour is very important in making cakes, cookies, pies and etc. 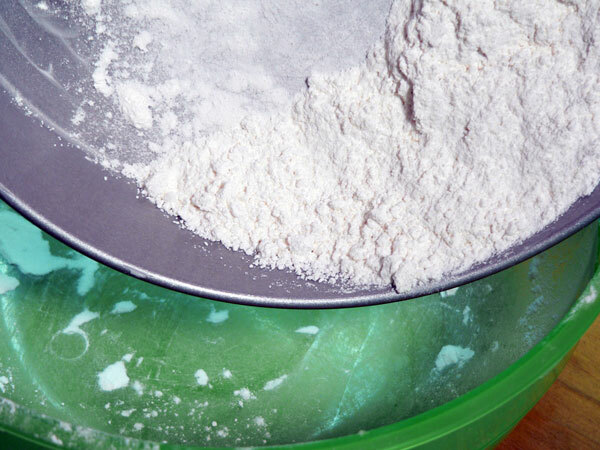 If you just scoop flour out of a bag, you’ll get more flour added into the recipe than you might need. Sifting sort of “fluffs up the volume” a bit as it adds air into the packed flour and also can remove lumps or impurities. 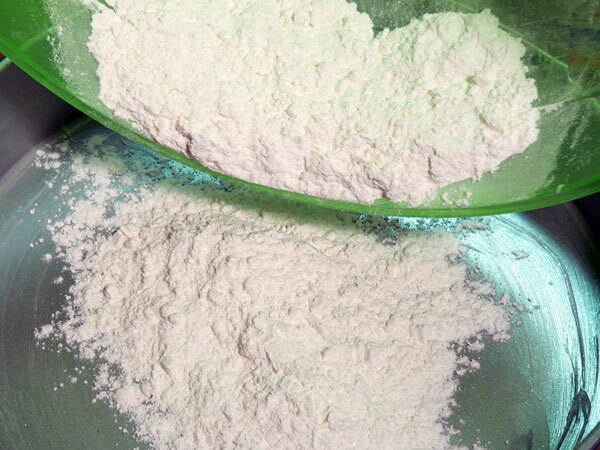 In the old days, sifting would help remove anything that might have fallen into the flour as it was being milled. It just makes for lighter cakes, cookies and other pastries. 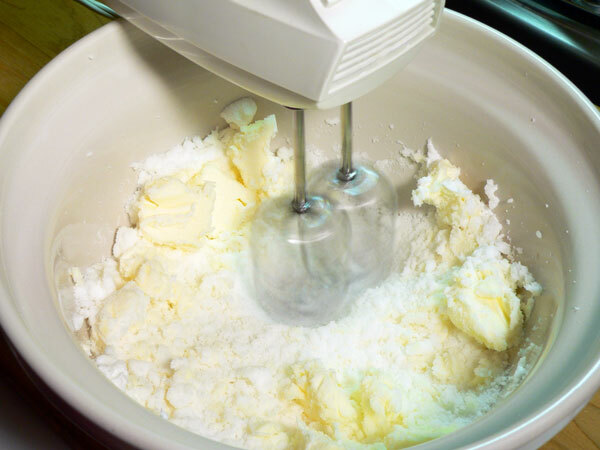 A sifter is a valued piece of equipment in the kitchen. Sifting is also a great way to mix dry ingredients together. Here, I’m adding the Baking Powder right into the sifter. Sift the dry ingredients together. 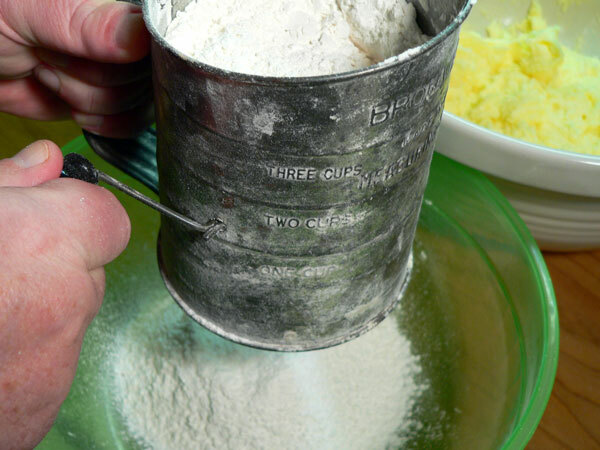 Hold the sifter down in the bowl as much as possible to keep flour from going all over the place as you turn the handle. Kids really love doing this part if you have one around watching. 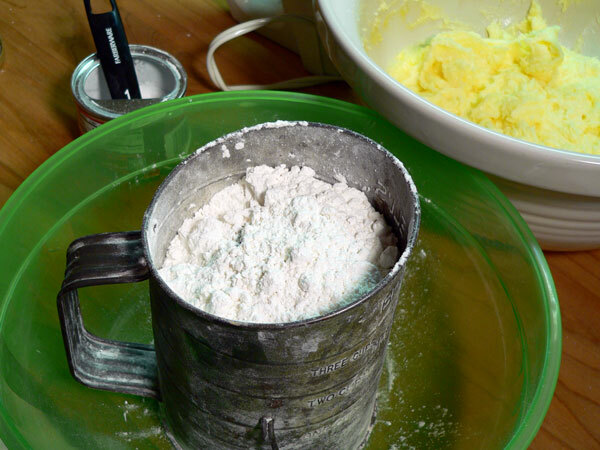 Add one measured, level cup of the sifted flour into the wet ingredients. Level Cup: As we mentioned above, you don’t want to just scoop flour out of the bag. 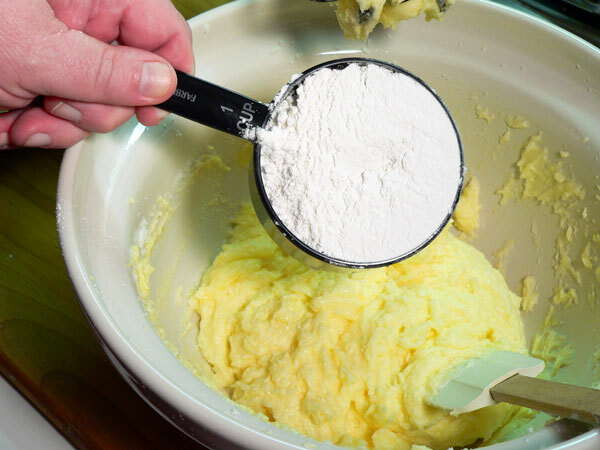 Now that you’ve sifted all the dry ingredients together, take a large spoon and scoop flour from your bowl into a one cup measuring cup. Fill it to full and over flowing. 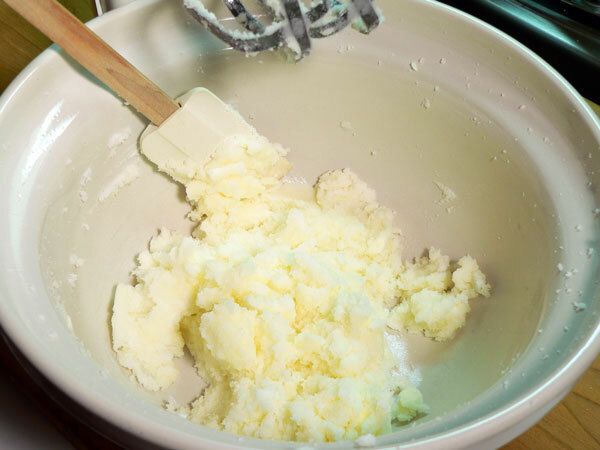 Then, take the back side of a butter knife and run it across the top of the measuring cup as you rake off the excess flour. This gives you a level cup of flour for your recipes. 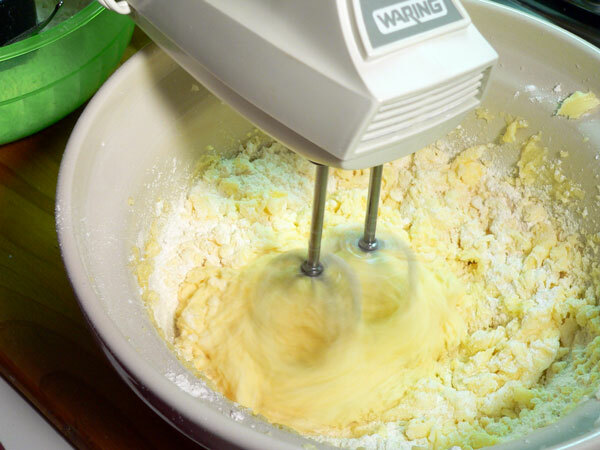 Using the mixer on low speed again, mix the dry flour into the wet ingredients. Add about half of the Milk into the mixture. Again, we’re doing this in steps, adding a little at a time as we go. Mix the milk into the batter. Stay on the low speed to avoid splatters. Add in the next level cup of Flour. 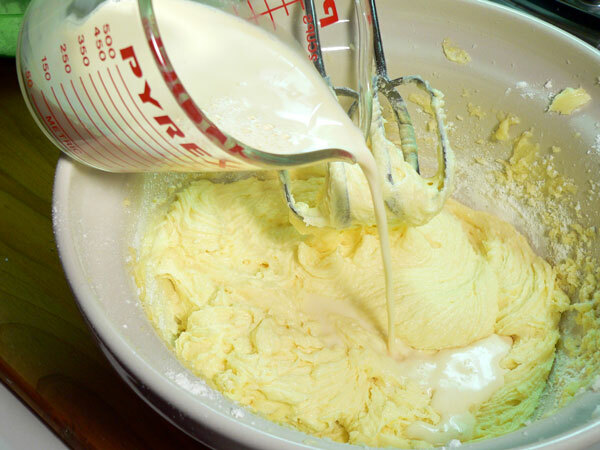 Mix the batter again. Just enough to incorporate the last amount of flour that was added. Add the rest of the Milk into the mixture. Mix the milk into the batter. Don’t forget to scrape down the sides again. Add in the last of the Flour. Mix the flour in real good. 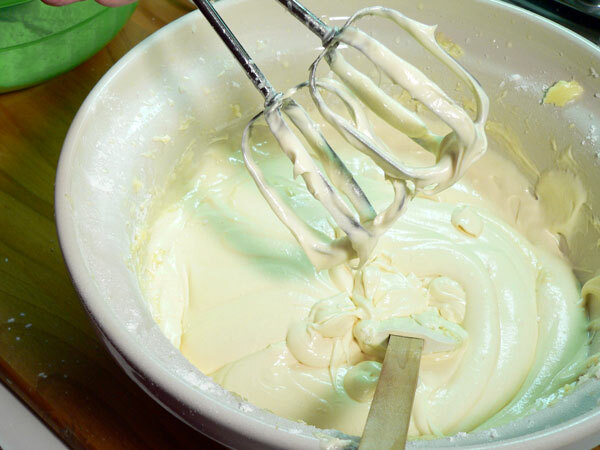 Mix everything together until the batter is smooth and creamy looking. Don’t over do it… just be sure to scrape down the sides and get it all mixed together good. Now, add the Vanilla Extract. If needed, scrape down the sides of the bowl one more time. 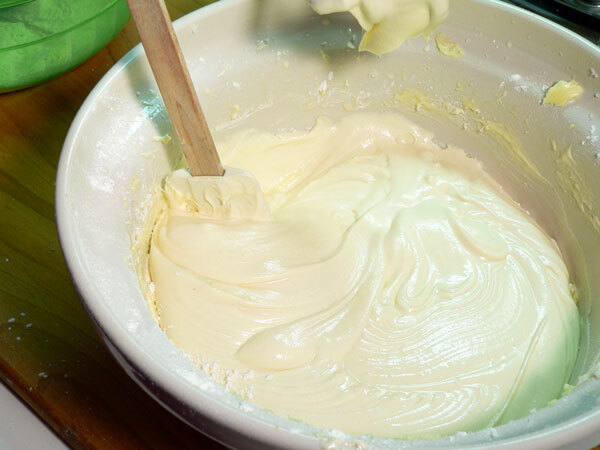 Don’t leave anything out of the batter. 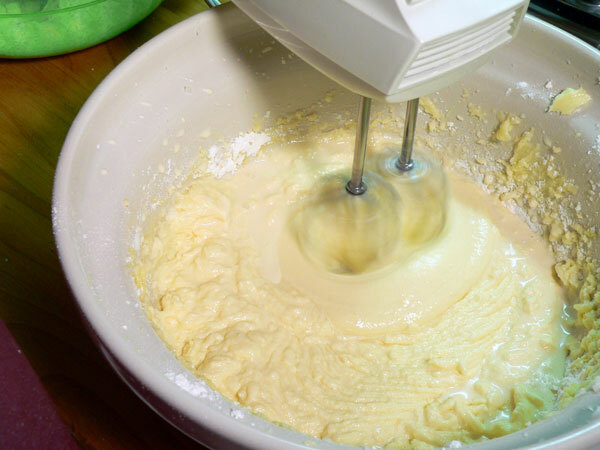 After its all mixed, use the spatula and remove as much batter from the mixer blades as possible. Set the batter aside until we can prepare the pans. Take some shortening and coat the bottom and sides of a 9 inch pan. We’re making two layers with this recipe. You should have some Flour leftover from where you sifted it. Sprinkle a good amount of this in the bottom of your pan. Then, gently shake it all around until the bottom is completely covered with flour. Tilt the pan sideways and roll the flour all around the pan until the inside edges are also coated with flour. 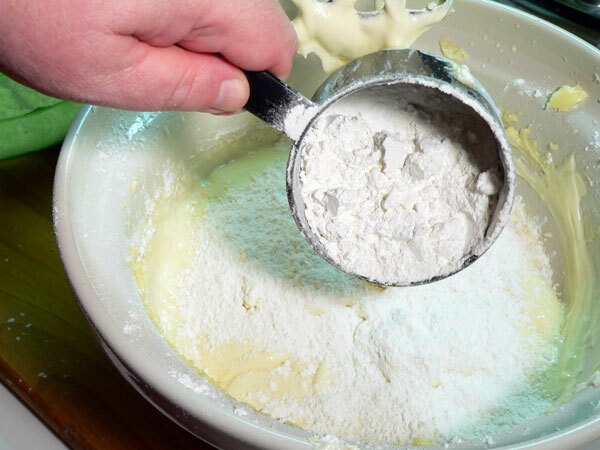 Turn the pan upside down over the bowl you had flour in and gently tap out the excess flour. 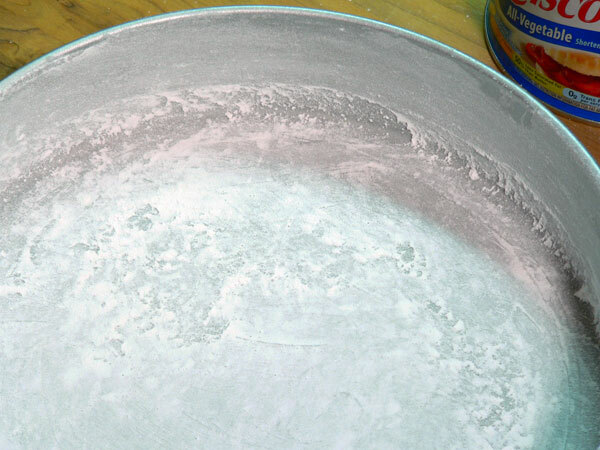 Your pan should have a fairly even coat of flour on the bottom and all around the inside edges. Make sure you don’t have any excess lumps of flour around the inside edges. Turn the pan over and tap it out again if needed. 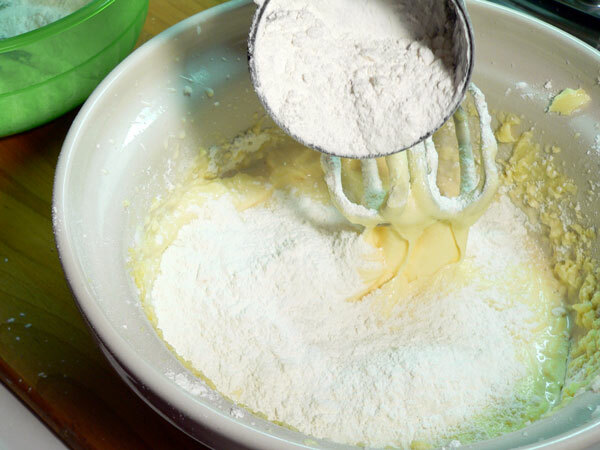 Flour built up in the corner edge of the pan will not bake into the batter while its in the oven. It causes the edges of your layer to have dips and uneven edges. Gently spoon half of the batter mixture into the pan. This measured out to be THREE level cups of batter for each of the two pans. Place it in the center of the pan and let it spread out towards the edges. 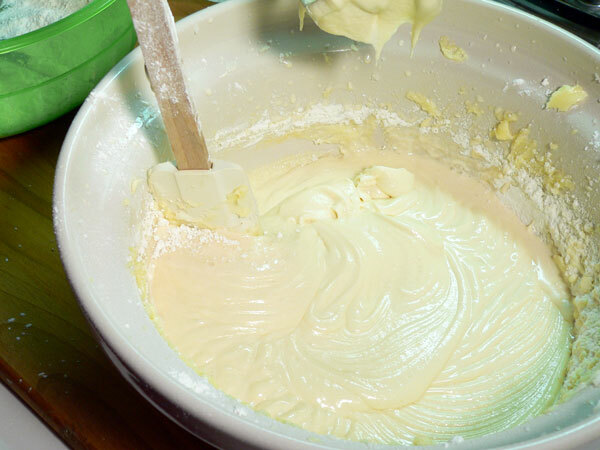 The batter is a bit thick and will not spread out completely. We’ll have to help it a bit. 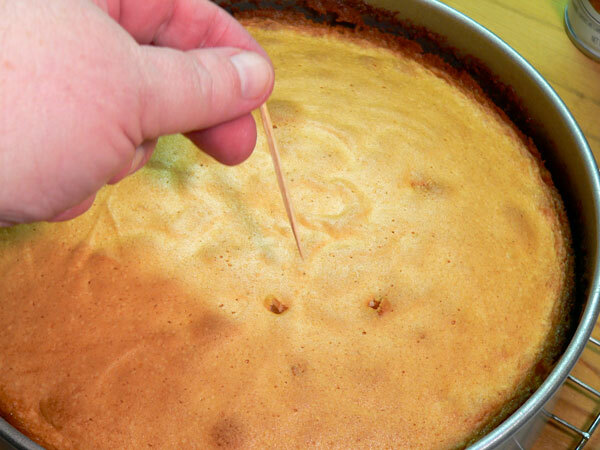 Use the back of a spoon and start spreading the batter out from the center of the pan to the edges. Try not to scrape the sides of the pan or you might remove some of the flour coating. We don’t want the layer to stick to the pan now do we? 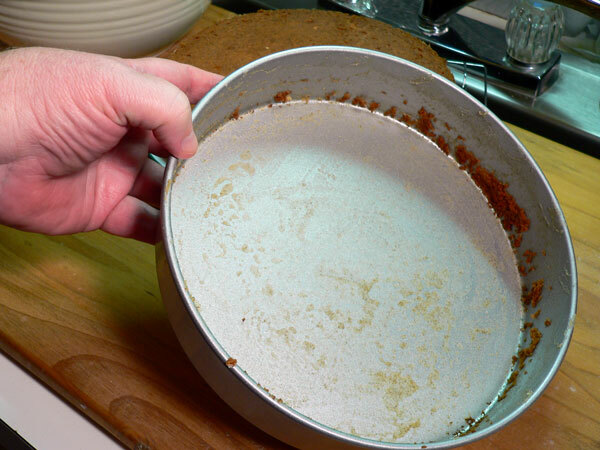 After you’ve smoothed it out, lift the pan a couple of inches from your counter and just DROP IT. I normally do this a couple of times. It helps to settle the batter even more in the pan and, helps release any bubbles that might be in the batter. Besides, it’s good therapy. Place the layer or layers in the oven and bake at 325º for about 20 minutes. Oven temperatures vary so watch your layers carefully. Give them about 15 minutes to bake without opening the oven. You should start smelling the layers baking about this time, smells good doesn’t it? Time is always a variable part of baking. You may also need to make adjustments based on your location and altitude. 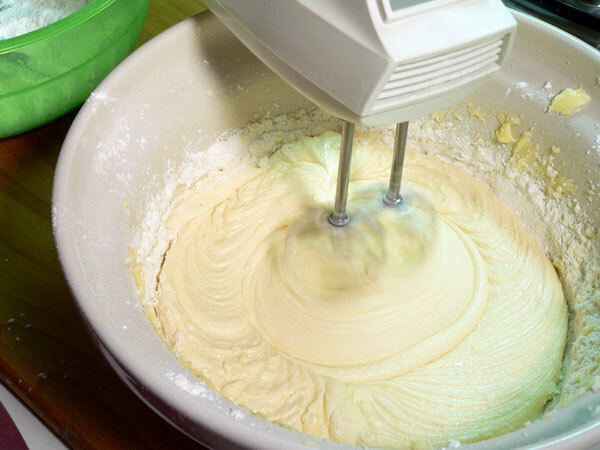 The amount of moisture in a batter will affect the amount of time needed to bake a layer until it’s done. The more you bake and use your oven, the easier it gets to produce those perfect baked goods. You know, practice makes perfect. Right? 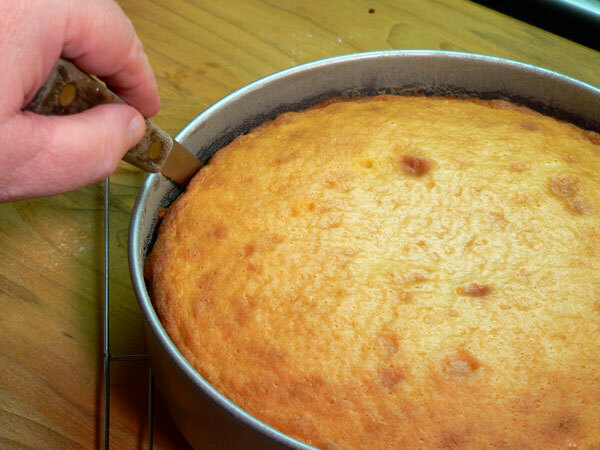 Test the baked layer to be sure its done by inserting a wooden toothpick into the thicker part of the layer. If the toothpick pulls out clean, the layer is done. If it pulls out with a few crumbs sticking to it, place the layer back in the oven for another minute or two. Place the baked layer on a wire rack to cool. 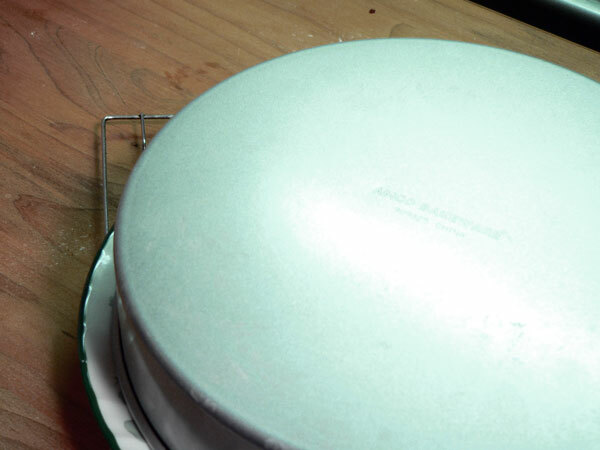 The layer should sit, uncovered, on the wire rack for about 10-15 minutes before you try to remove it from the pan. 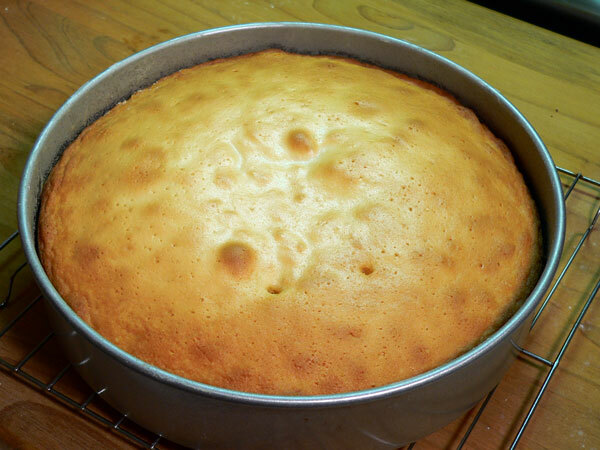 Here, you can see where the layer has slightly pulled away from the edges of the pan as it baked. Most layers will have a slight bubble in the middle. You can try to press this down a little, it might work and might not. 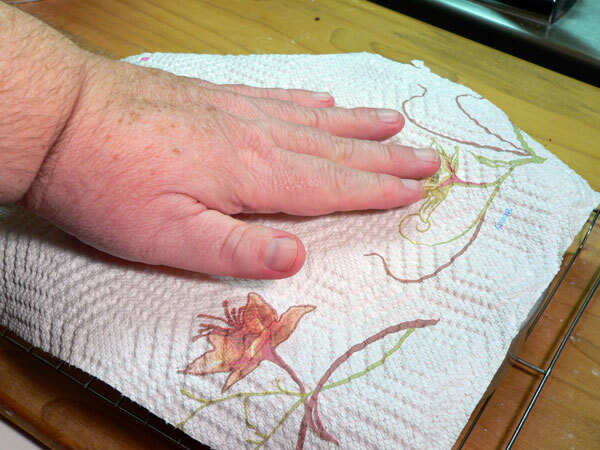 Place a clean paper towel on the layer just after it comes out of the oven and gently press the center. You wont get it to go down completely but it can’t hurt. Just do it gently so the paper towel doesn’t stick to the top of the layer or, you could end up pulling the top of the layer off when you remove the towel. Don’t leave the towel on the layer as it cools though. To help remove the layer from the pan, run a knife all around the edge between the layer and the pan. 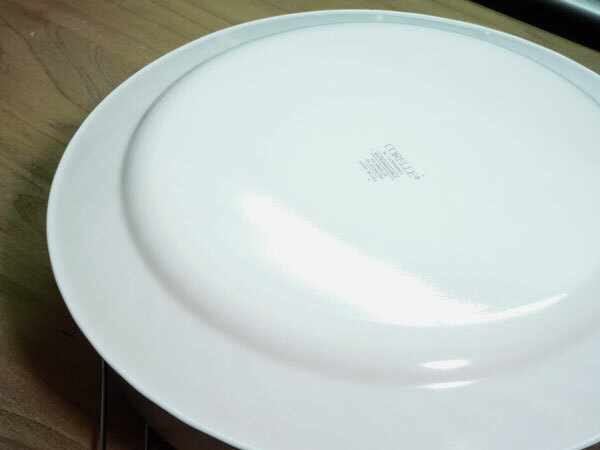 You can turn a plate over on top of the layer or, use another wire rack if you have an extra one. We’re going to flip the layer over so we can remove the pan. Holding all three pieces together, carefully flip the layer over. 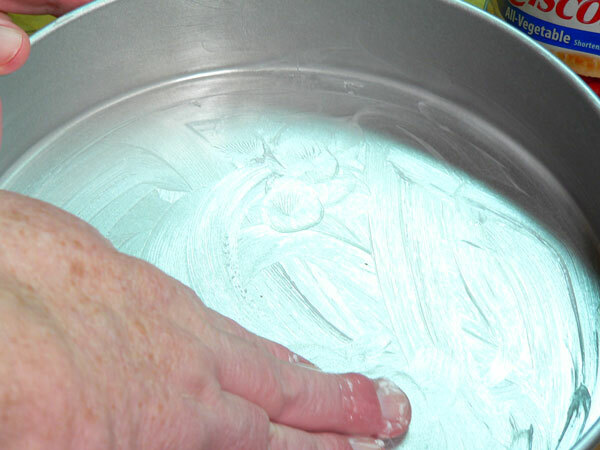 Use your fingers and gently tap around the bottom of the pan to help release the layer. Slowly lift the pan away from the layer. As you lift, you should be able to tell if the layer has released or not. If it doesn’t feel like its letting go, gently tap the bottom of the pan. Hopefully, it will drop right out. The pan should pull away clean. As you can see, I had some minor sticking around the edges. Probably needed a bit more shortening and flour in that area. That’s why pan prep is so important. Of course, a layer of frosting will hide many of the imperfections. Once you remove the pan, turn the layer back over onto the wire rack. If you do it carefully, you should be able to flip the layer with your hands. 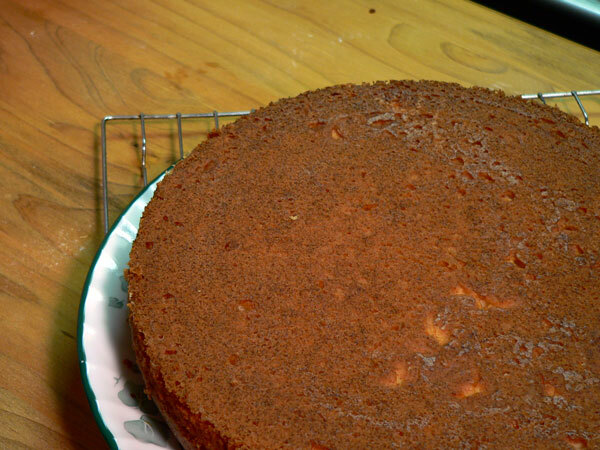 Its best to leave the cake right side up as it cools completely. 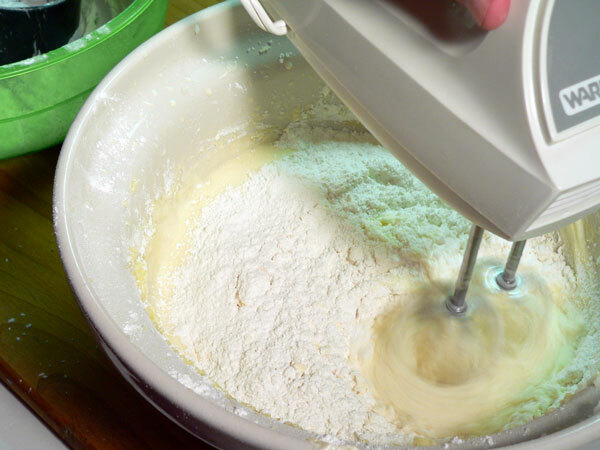 Any excess flour on the top or bottom can be gently brushed away. Always let your layer cool completely before adding any filling or frosting. You can thank me later. 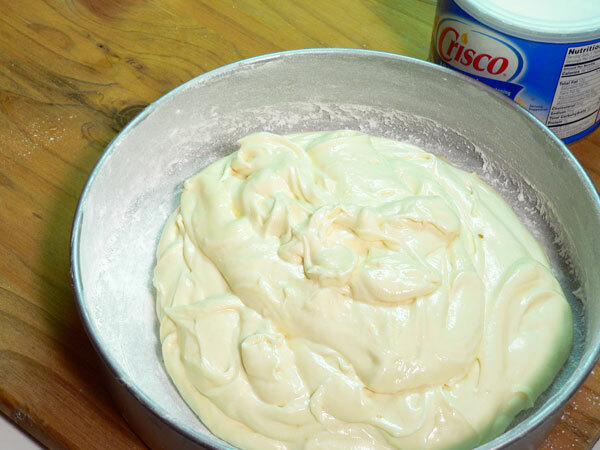 Once the layers are cooled, you can add your favorite frosting or, you can save the layers for later. If you plan to frost the layers the next day, wrap each one securely in plastic wrap. The layer could then just be left out on the counter overnight and frosted the next day. If you don’t intend to frost them within 24 hours, make sure they are wrapped well with the plastic wrap and then place them in the freezer until needed. 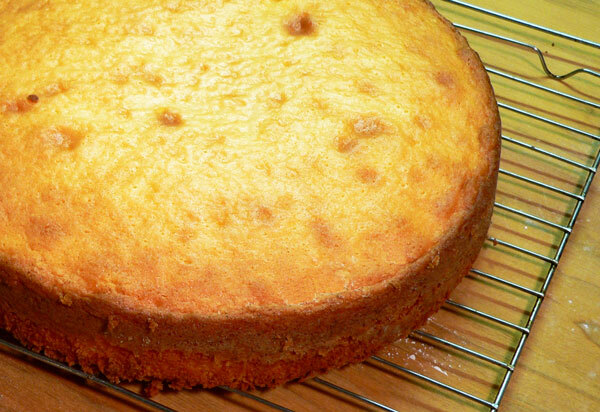 Some folks think freezing the layers for a few days increases the flavor and helps the texture of the finished cake. You might want to test out this theory yourself and see what you think. 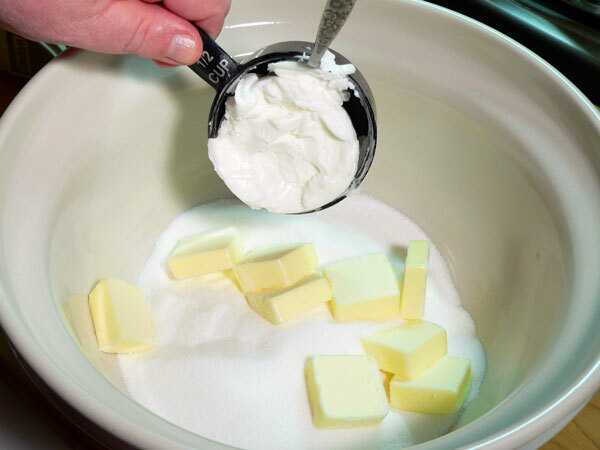 In a mixing bowl, add sugar, butter, shortening, cream together on low speed until mixed. 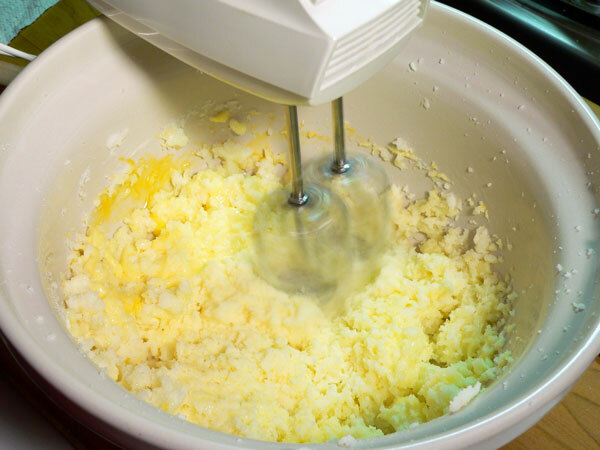 Add eggs, one at a time, mixing briefly after each one is added. In a separate bowl, prepare the dry ingredients. Place sifter in bowl. 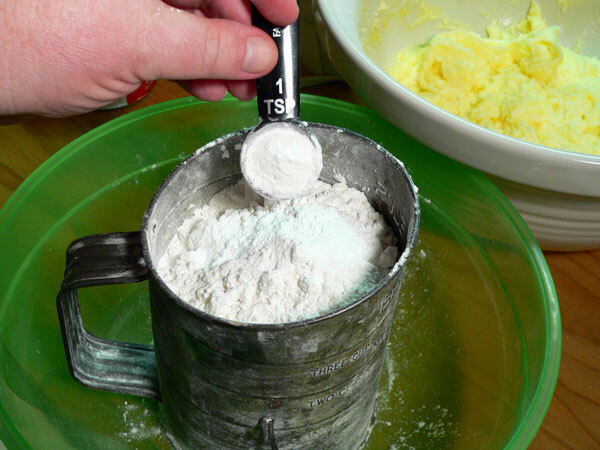 Measure out flour, one level cup at a time and mix into wet ingredients. Add half a cup of the milk. Mix again. Add another cup of flour and mix until its incorporated well. Add remaining milk, mix again. Add last of the flour and mix well, scraping down sides of bowl as needed. Coat the bottom and inside edges of a 9 inch baking pan. Flour the bottom and inside edges of the pan with flour, coating well. Tap out any excess flour. Pour 3 cups of the batter into each of the two pans. 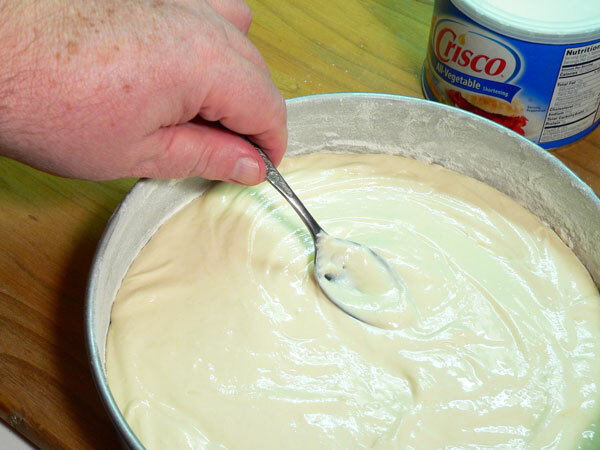 Use the back of a spoon and carefully spread the batter out to the edges of the pan. Lift the pan straight up from the counter a couple of inches and drop it to settle the batter. Place in oven. Bake at 325º for about 20 minutes or until done. Test with a clean wooden toothpick to be sure the layer is done. Remove the layer, place on a wire rack and let cool for 10-15 minutes. Run a knife around the inside edges of the pan to loosen the layer. Place a plate or another wire rack on the top of the layer, hold together and flip it all over. Gently tap the bottom of the pan and lift the pan from the layer. Use your hands to flip the layer back over onto the wire rack. Let layers cool completely before adding any frosting or filling. Layers may be baked a day ahead of time, allowed to cool, then wrapped in plastic wrap to be frosted within 24 hours. Layers can also be wrapped in plastic wrap and frozen for up to 3 months before using. Your Comments: How often do you bake cakes? Do you ever make your layers from scratch or do you prefer the boxed cake mixes? Either way, I’d love to hear your comments about your cake baking adventures. Please take a moment and share your experiences in the section below. If you try our recipes, please let us know how they turn out for you. Your comments may help our other readers as they decide to try to bake their own cake layers from scratch. Please know that all of our comments are moderated in order to keep our site family friendly. That just means that I personally read each and every comment before its approved to appear on Taste of Southern. I also try to reply to as many comments as possible so check back again to see our response. We sincerely appreciate your comments and your support and, I hope you find our recipes helpful. If you like what we do, please share our information with your family and friends and, help us spread the word about our recipes. I also invite you to Subscribe to our Newsletter by entering your Email address in the box below or at the top right of each of our pages. We’ll send you an update each week about our newest recipe and any other updates made to our site as we go. It’s the best way to remember to check back with us often. I’d greatly appreciate it. Delicious!!! I made the mistake of using store bought frosting. Never again!! Getting ready to make my second cake!! My husband loved it. Going to make this next time I’m making a cake! Will let you know how wonderful it is!!!!! 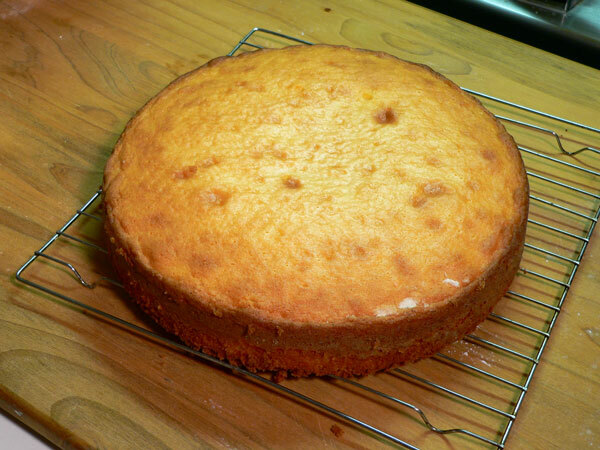 Hi Steve, I am going to try your basic cake recipe because I have never used carnation milk on a scratch cake. I’ve baked plenty, box, scratch and doctored box cake. But I was told about Maxieb’s in Greensboro. Especially the strawberry cream cake or the strawberry pots cupcake and I would like to try it. Thanks for the cake but how can I create the filling especially for the cupcakes? Do you have any idea? 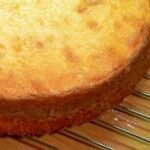 Hi Josette, I hope you’ll like the cake layers and Thank You for testing out our recipes. I checked the Maxie B’s website and it looks like a place I’d like to spend a little time in. OK, a LOT of time in. All their cakes look really good. I’m ready for fresh Strawberries to return. I visited the State Farmers Market in Raleigh yesterday and one of the vendors had fresh Strawberries for 3.50 a pint. They came from Wilmington and tasted pretty good for this time of year. I didn’t get any this time, maybe next. I’m new to your website and it’s brought back tons of wonderful memories. Love the basic cake layers recipe can’t wait to try it. Stay blessed. Steve, I just was looking around the web for whatever I could find about the Brownstone Front Cake. I had mentioned that my sister’s relatives from Alamance County had a family recipe for the cake, and I found on the internet that a restaurant in Gibsonville, NC (Alamance/Guilford County) called Delancy’s serves/makes the Brownstone Front Cake. I’ve never been there but will have to check it out. www.http://delancysrestaurant.com Check out their pies/cakes menu to see a description of the cake that they say is their #1 seller! I came to check out the recipe/tutorial for the cake layers after reading the newsletter. I prefer making my own layer cakes from scratch. . . honestly, it’s been years since I bought a box of cake mix! Even though I love baking cakes (but don’t do kids’ theme cakes) and have five children, four of my children like for me to make this “junk food” cake for their birthdays. (This involves 3 packages of Little Debbie Swiss Rolls, Jello chocolate pudding and Cool Whip constructed “elegantly” in a springform pan. Yikes!) One of my children likes cheesecake. My husband prefers German Chocolate Layer cake or coffee ice cream torte of some sort. So, the only thing I ask for at my birthday time from my husband is that he give me a full afternoon to bake my own birthday cake! That is luxury indeed! I love Southern layer cakes of all kinds. . . it brings me great joy to walk into a restaurant and see at least three or more choices of layer cake in a display cooler. One layer cake that intrigues me is the Brownstone Front Cake. Although my folks are Southern and from NC (Durham, Wake and Orange Counties), I can’t recall any of my family making this. My sister’s in-laws from Alamance County apparently have this type of cake in their family repertoire. The Brownstone Front Cake served at Mimi’s Bakery in Greensboro is good if you ever get to try (although, a little bit on the sweeter side compared to the one I attempted to replicate from an old Charlotte Junior League cookbook I bought). 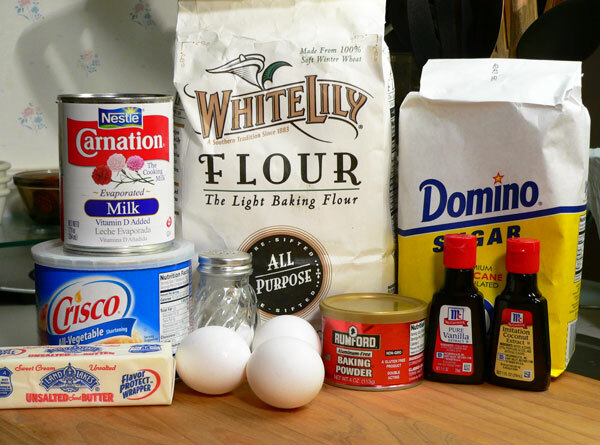 I did a little research around the internet over the past couple of years and found some similar recipes for the Brownstone Front Cake, but the history of the cake isn’t always “Southern”. . . some have made it literally into a chocolate “brick” with chocolate frosting as opposed to the very light chocolate layers with a “crispy” kind-of caramel icing (which is more Southern). If you are familiar with this cake, Steve, I’d love to hear what you think! Thanks! I’ll be happy to pass along the few recipes I have for the Brownstone Front Cake if you’d like to try them. Also, I accidentally typed in Mimi’s Bakery in Greensboro. That should be Maxie B’s in Greensboro! http://www.maxieb.com I guess there’s a Chinese restaurant next door to it called Mimi’s Kitchen. My bad! If you go to Maxie B’s website, they actually have the Brownstone Front Cake listed under their “Caramel Cakes”! So maybe it’s just a light chocolate variation on the usual caramel cake. Hmm. I wouldn’t mind getting down to the bottom of this cake (figuratively and literally) myself. If you get to Greensboro, stop by the bakery! It’s on Battleground Ave. not far from Stamey’s (not the Coliseum Stamey’s). . . which makes for another great food stop, haha! Thanks for your site! I’m enjoying it!